Bill Mauldin was the most famous cartoonist of World War II. 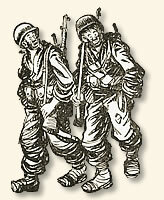 His Pulitzer Prize-winning cartoon characters "Willie and Joe" humorously depicted the everyday trials, tribulations and triumphs of the American combat soldier. The majority of these front-line fighters were citizen-soldiers longing to return home to the normality of their former lives. Mauldin's artistic talent and fondness for cartoons developed early in his life, but the tough times of the Depression didn't provide any avenue for him to apply his talent. He joined the Army in 1940 at the age of eighteen. Mauldin became part of the 45th Division that saw action in Sicily, Italy, France and Germany. 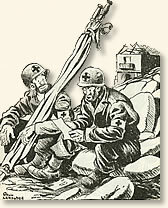 Mauldin began drawing cartoons depicting Army life for his Division's newspaper. Once he was overseas, his cartoons appeared in the Army's Stars and Stripes newspaper as well as numerous newspapers back home in the states. His "no holds barred" characterizations of everyday life on the front line were an immediate hit with the solders he depicted. However, his cartoons occasionally drew the wrath of his superior officers. He was once chewed out by General George Patton and ordered to cease drawing his soldiers in what the general considered an "unsoldierly" appearance. This admonishment had little effect on Maudlin who continued to draw his subjects as before. In 1945 Mauldin published a book in which he described the qualities of the combat soldier. His words provide insight into the motivation and challenges of the front line soldier, not only in World War II, but in all conflicts. "Many celebrities and self-appointed authorities have returned from quick tours of war zones (some of them getting within hearing distance of the shooting) and have put out their personal theories to batteries of photographers and reporters. Some say the American soldier is the same clean-cut young man who left his home; others say morale is sky-high at the front because everybody's face is shining for the great Cause. They are wrong. The combat man isn't the same clean-cut lad because you don't fight a kraut by Marquis of Queensberry rules. You shoot him in the back, you blow him apart with mines, you kill or maim him the quickest and most effective way you can with the least danger to yourself. He does the same to you. But you don't become a killer. No normal man who has smelled and associated with death ever wants to see any more of it. In fact, the only men who are even going to want to bloody noses in a fist fight after this war will be those who want people to think they were tough combat men, when they weren't. The surest way to become a pacifist is to join the infantry." "While men in combat outfits kid each other around, they have a sort of family complex about it. No outsiders may join. Anybody who does a dangerous job in this war has his own particular kind of kidding among his own friends, and sometimes it doesn't even sound like kidding. Bomber crews and paratroopers and infantry squads are about the same in that respect. If a stranger comes up to a group of them when they are bulling, they ignore him. If he takes it upon himself to laugh at something funny they have said, they freeze their expressions, turn slowly around, stare at him until his stature has shrunk to about four inches and he slinks away, and then they go back to their kidding again. It's like a group of prosperous businessmen telling a risqu� joke and then glaring at the waiter who joins in the guffaws. Combat people are an exclusive set, and if they want to be that way, it is their privilege. They certainly earn it. New men in outfits have to work their way in slowly, but they are eventually accepted. Sometimes they have to change some of their ways of living. An introvert or a recluse is not going to last long in combat without friends, so he learns to come out of his shell. Once he has 'arrived' he is pretty proud of his clique, and he in turn is chilly toward outsiders. That's why, during some of the worst periods in Italy, many guys who had a chance to hang around a town for a few days I after being discharged from a hospital where they had recovered from wounds, with nobody the wiser, didn't take advantage of it. They weren't eager to get back up and get in the war, by any means, and many of them did hang around a few days. But those who did hang around didn't feel exactly right about it, and those who went right back did it for a very simple reason - not because they felt that their presence was going to make a lot of difference in the big scheme of the war, and not to uphold the traditions of the umpteenth regiment. A lot of guys don't know the name of their regimental commander. They went back because they knew their companies were very shorthanded, and they were sure that if somebody else in their own squad or section were in their own shoes, and the situation were reversed, those friends would come back to make the load lighter on them." "But the dogface's real hero is the litter bearer and aid man who goes into all combat situations right along with the infantryman, shares his hardships and dangers, and isn't able to fight back. When the infantryman is down, the medic must get up and help him. That's not pleasant sometimes when there's shooting. The aid men and litter bearers know that their work is often far more important than that of the surgeon at the operating table; because if it were not for the aid man the casualty would not live to reach the surgeon's table. Let's say the doggie has a shattered leg and is lying in a shell hole out in front of his company, which is pinned down by machine-gun fire. He uses the bandage from his first-aid packet to make a tourniquet, and he takes the sulfa pills, but he knows that if he lies there much longer he will bleed to death. Nobody is going to blame the aid man if he saves his own neck And doesn't go out after a man who will probably die anyway. But the medic usually goes. If the Germans are feeling pretty good, they might lift their fire when they see his red-cross armband. Put yourself in the wounded guy's shoes when he sees the medic appear over him, and his pain is dulled by morphine, his bleeding is stopped, and he is lifted out and carried back to safety and good surgery. Sure, he's going to love that medic. And after a few dozen men owe their lives to one man, that little pill roller is going to be very well liked indeed. Sooner or later, like everybody who works around the infantry, the medic is going to get his. Many aid men have been wounded and many have been killed. It should comfort the families of those who have died to know that there are many friends who grieve with them." Bill Mauldin's account appears in: Mauldin, Bill, Up Front (1945); Mauldin, Bill The Brass Ring (1971); Stars and Stripes European Edition, "Cartoonist Bill Mauldin, friend of GIs as creator of 'Willie and Joe,' dies at 81" (January 23, 2003). "America's Front Line Soldier, 1944," EyeWitness to History, www.eyewitnesstohistory.com (2006).